It isn’t just for reading. That’s the difference. When I first started blogging in January of 2002, I went something like six solid months with less than 20 people reading my thoughts on a daily basis. That’s the dirty secret about blogging that both supporters and critics don’t get: it’s easy to do, but very hard to get enough readers so that anybody notices. When I find out that someone has blogged, they have instant credibility. Sure, anyone can write. But to do so consistently, and make it insightful and entertaining without payment or promise of payment or even any hope that what you’re doing is going anyplace beyond dissolving into the ether – I want to know these people. That is a story of faith. And passion. And dammit, nobility. Which is why it kills me that it may be harder to blog now than it was when I started. At least then it was new and fresh. Now it’s so loud out there, I don’t know how any new voice ever gets heard. And I’m as guilty of the deafness as anyone. I simply can’t keep up with all the Twins blogs that have sprouted up only to go silent. 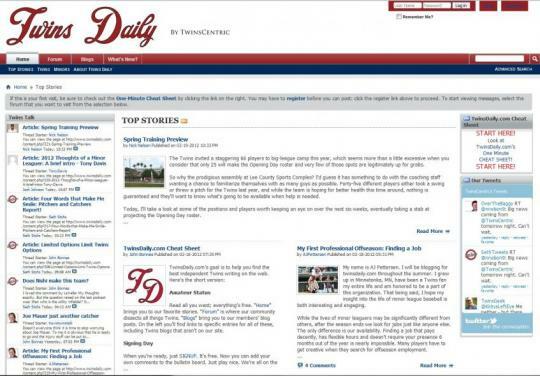 That’s why TwinsCentric is very proud to announce the launch of TwinsDaily.com. We’re each setting aside our independence to start a central site where you can find (for free, mind you) all our stories. But the site isn’t just for reading. There are two other very important pieces. First, in the hope of resurrecting the spirit of the old Dickie Thon Twins Board we’re including a forum where you can discuss all kinds of Twins topics. All we ask is that you register so we have some accountability for the discussions, and that you keep it civil. We’re all on the same team. Second, when you register, you get a blog. You can ignore it if you want, or you can try out your voice. If your post is good, we’ll find room for it on the front page. And if it’s bad? Well, then we won’t. But at the very least you’ll be trying to find your identity where thousands of Twins fans are stopping by each day. TwinsCentric has worked on several magazines, books and e-books over the last couple of years, but I think it’s safe to say that we’re more excited about this than any of them. This is a site we want to exist: a local place where Twins fans can gather, read, share and write. If that sounds great, then please swing by. And if it sounds too over the top, swing by anyway, because that’s exactly what we want it to be. P.S. If you’re looking for a good place to start, stop by the front page or check out our one-minute cheat sheet.